Two arms control the position of a pen, and a third motor lifts the assembly in order to raise or lower the pen to the drawing surface. Gravity does most of the work for pen pressure, so the badge needs to be hanging on a lanyard or on a tabletop in order to work. An ESP32 using [Bart]’s own port of Grbl does the work of motion control, and a small stack of Post-It notes serves as a writing surface. Without the 3D printed parts, [Bart] says the bill of materials clocks in somewhere under $12. We’ve seen similar designs doing things like writing out the time with a UV LED, but a compact DrawBot on a badge is definitely a new twist and the fact that it creates a physical drawing that can be peeled off the stack also sets it apart from others in the badgelife scene. If you were lucky at the 2015 World Maker Faire you may have stumbled upon strange writings of poetry on the ground — written in sand. While at first confusing, if you followed the poetry along you also caught a glimpse of Skryf, a draw bot by [Gijs van Bon]. The creator was asked to perform poems for a festival about transition and letting go. Naturally, building a robot to write poetry in sand was the downright obvious answer to the question. I was asked to perform 40 poems during a 10 day festival, and the poems were about transition and letting go. And then I thought the obvious thing to do as an artist is to make a machine that writes those poems with sand. I started writing them, and when the third poem was written, the first one was completely gone, and it was such a beautiful thing. With the Olympics on there are a lot of really great camera shots shown during the events. One of the best is the overhead view, which is provided by a camera suspended between cables. It’s not new for the Olympics, SkyCam has been around for over twenty years. 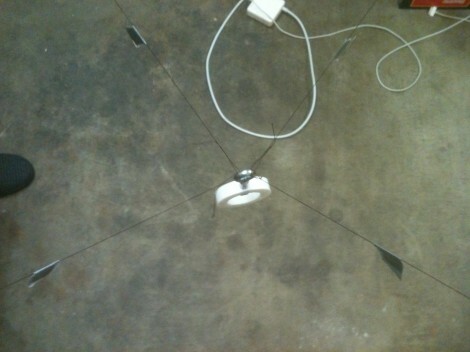 What is new is [Dan Royer’s] attempts to build his own aerial camera setup. He’s not starting from zero with this project. [Dan] has done some really great work with the Drawbot. It’s a two-motor, two-axis plotter which uses CNC to draw on a white board. For this project he combined two Drawbots in order to add a third axis. The image above shows the camera mount suspended between the four strings. He’s been working hard on getting the software ready for this kind of addressing. Along the way he broke the strings a few times because he was too far from the kill switch to stop it in time. But what he’s got is a nice start and we hope to see a more illustrative follow-up soon. One of the things that SkyCam has going for it is a stabilization system. We wonder if a spinning gyroscope would work as well as it did for that balancing bike.